Pros: A poignant, witty and heart rendering story delivered with depth by a credible and vibrant cast. The stage direction and production values are excellent. Cons: Very few. The off stage sound effects were inaudible, which made the dialogue a little confusing, but I am a bit deaf! Sadie has passed away after a lifetime of illness and pain. She leaves a devoted, loving husband, Mordecai, who cared for her at home until her death, and an estranged son, Ben, who hasn’t been home for years. Despite her cynicism of Orthodox Judaism in her early life, religion was important to Sadie in her final years so Mordecai aims to make everything as she would have wanted it after her death. He enlists the student Rabbi, Joshua to perform the service and lead the family in the Shivah, and Joshua is tender, patient and caring as he supports the grieving men. As the play progresses we come to understand the pain and loss that Mordecai and Ben are experiencing and that the motivations of all involved are not what they first appear. The two men face the greatest hurdles of their emotional lives – for Mordecai, letting go and for Ben, coming home. This is a finely crafted script, which uses a simple setting and just three characters to unravel the complexities surrounding the intensity of love, the grief of loss and the relationships between these men and religious faith. By the interval I really felt the pain, confusion and fragility of the father and son – the back story that leads them to this moment is deftly revealed through natural dialogue and circumstance. Rabbi Joshua acts as a catalyst in the story, balancing the polarised emotional states, yet revealing his own agenda as the story progresses. The characters are so relatable and ordinary, yet intricate and unique in their circumstances. The development in the second act is masterful and the twist is subtle yet clearly meaningful – we learn so much about what is really going on inside their hearts and minds. The stage design and direction is simple yet perfectly pitched and I found myself believing every word and action. This production is really good. The acting is strong and very well cast – David Horovitch’s twitching, fidgety Mordecai is a little unnerving at first but adeptly belies the mental anguish that the character is suffering. 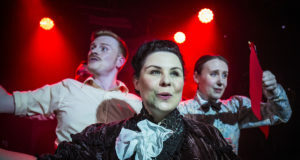 This is an impressive and energetic performance, and Horovitch connects with the audience and tugs at their heartstrings without gratuitous sentimentality. 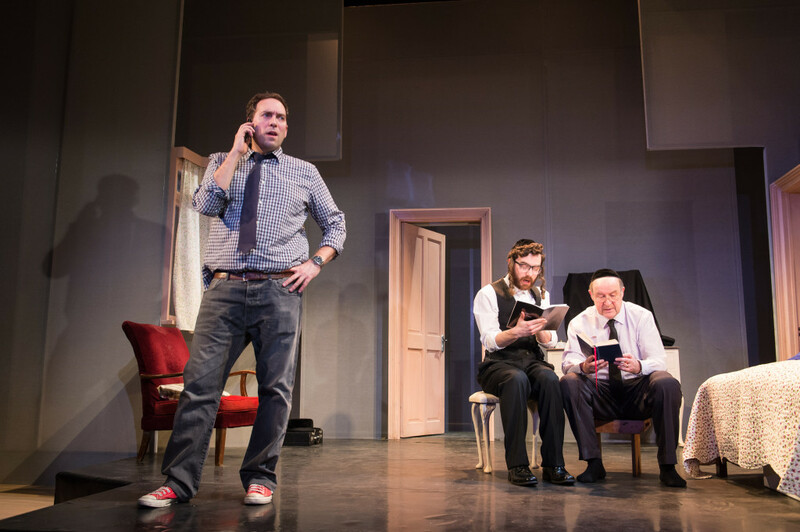 Ben Caplan cleverly portrays his son, Ben, as aloof, disrespectful and nonchalant yet with an underlying vulnerability that is well presented. 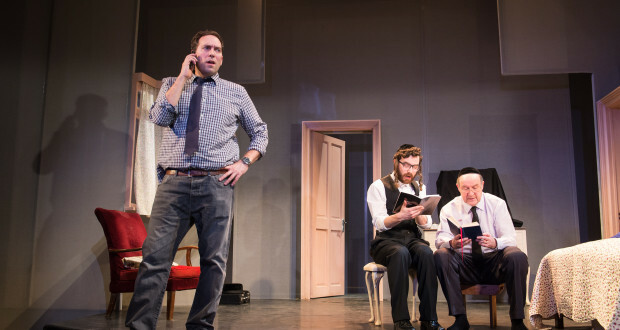 Ilan Goodman plays Rabbi Joshua with gentleness and sensitivity, quietly resolut and tenacious. All three actors contrast their characters so completely that it really brings the themes to full fruition in the most believable and touching way. These are strong performances and work well together on stage. I take my hat off to the Watford Palace Theatre, not only for being a comfortable, welcoming, well equipped venue with a pleasant café and theatre bar, but also for bringing new writing and artistic performances of this calibre to the stage for a ticket price of £20 or less (full price tickets start at just £11.50 and concessions are available). 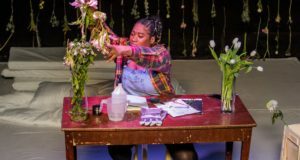 Shiver is a quality, highly enjoyable and thought provoking play. It will engage with a wide audience of all ages, religious and non-religious alike. I thoroughly enjoyed it and it is really worth seeing.